The world’s largest social network site for professionals, LinkedIn, which saw its stock price doubled on IPO debut, has officially launched LinkedIn for Android that provide easy access to connect to the social networking service for professional while on the go. With LinkedIn for Android, users able to get latest updates and messages from social network service, keep status up-to-date, and exchange information, ideas and opportunities with over 100 million professionals worldwide in real-time. 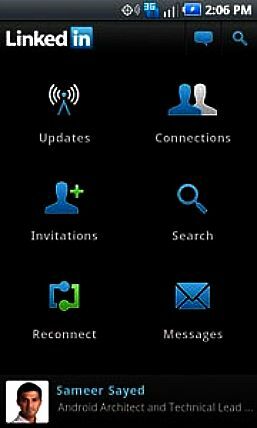 In addition, LinkedIn for Android also combined six features such as updates, search, connections, invitations, messages, and reconnect to enhance users experience in Android devices. View and share crucial business intelligence and updates. Search across over 100 million global professionals, and get the answer back in seconds. Get quick access to any of connections to get their up-to-date profile information, and the ability to send them a message immediately. Reconnect and build network from anywhere. LinkedIn for Android is free and available in the Android Market and the LinkedIn official website. The new addition of Android mobile app is in addition to LinkedIn mobile applications for the iPhone and Blackberry devices which are readily available. Download LinkedIn for Android app from Android Market.